I found the 2001 Apes movie for only 6 bucks. I can't seem to find the original for less than 12 bucks. Maybe I'll look harder. Anyway, having bought the 2001 version I want to buy the 1968 version so that I don't have to keep renewing it while I work on the Rematch, the way I've had to do with The Maltese Falcon. Not only that, I'd simply like to have that movie in my collection. I think I'll buy the 1968 version next time I decide to watch it. Haven't had a chance to catch up in this thread, so you'll have to settle for a bump for now. That was a good bump. But I prefer the bumps on your current avatar. Trevor's post about Let Me In reminded me of another future Rematch that I'd love to do. Especially since I've already read the book. It would give me an excuse to buy DVDs or Blu-rays of the two films, as well. I have yet to see the American remake, of course. I have yet to see the American remake, of course. I'll see it before you do. I'm finally watching the original film verision/adaptation of Lord of the Flies. Will report back when it's over. I'm finally watching the original film version/adaptation of Lord of the Flies. Will report back when it's over. That's good! I look forward to reading your comments. 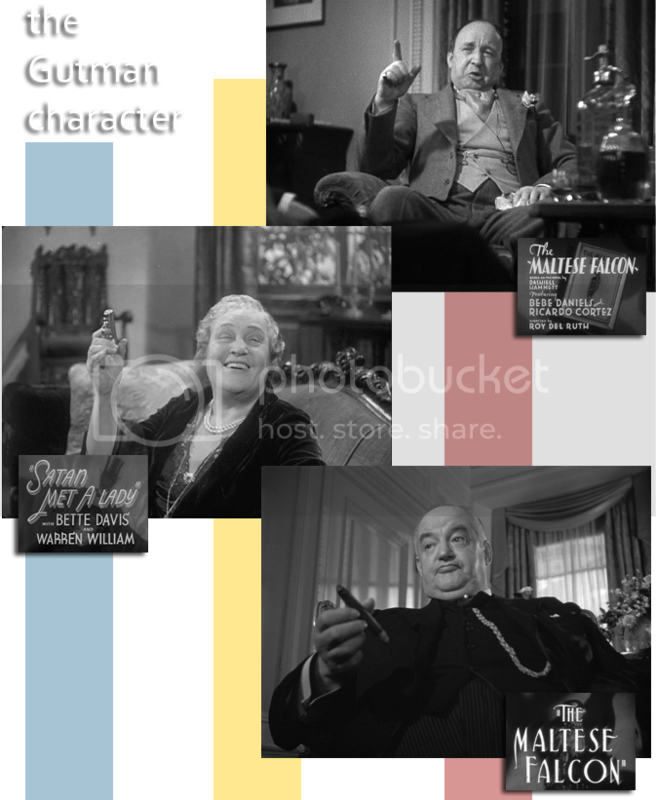 And I've gotten all my frame grabs done from all three adaptations of The Maltese Falcon. The 1960 version was directed by George Pal. Filmography. Pal did not begin his career as a science-fiction director. This biography page asserts that Pal became famous by animating cigarettes for French advertisements. Another page points out that Pal really hit the big time as a producer, not a director, with Destination Moon. He brought The War of the Worlds to the screen also, but is known for Tom Thumb and other family favorites. The 2002 version was directed by Simon Wells, the great-grandson of the author H.G. Wells, who wrote the original story. Filmography. Wells is known primarily for animation direction, according to Wikipedia. Also, this article at tributemovies.com, says that The Time Machine was his first live-action production. Wells' most recent project is Mars Needs Moms, to be released in 2011. He was the supervising animator on Who Framed Roger Rabbit? and has worked as a storyboard artist on a number of animated films, beginning with Antz, and most recently Flushed Away. Simon Wells was the director of An American Tail: Fievel goes West, Balto, and The Prince of Egypt. Thus, not only is The Time Machine his first live action film, to date it remains his only live action directorial project. The 1968 version was directed by Franco Zeffirelli. Filmography. Zeffirelli had prior experience adapting Shakespeare to the big screen, having created the 1967 release of The Taming of the Shrew, starring Elizabeth Taylor. But Zeffirelli has hardly been typecast as a director. His efforts range from the boxing film The Champ to documentaries. Regardless, no other film he has done has matched or eclipsed the impact of this one. The 1996 version was directed by Baz Luhrmann. Filmography. Luhrmann had directed only one feature film before he created this version of Romeo+Juliet. The actual title is William Shakespeare's Romeo + Juliet, but hardly anyone uses the complete title. His previous film was Strictly Ballroom. The feature subsequent to the Shakespeare adaptation was Moulin Rouge, a film that, like Romeo + Juliet seems to inspire either devout love or intense dislike. Luhrmann is currently working on what will be his fifth feature film when it is released in 2010: The Great Gatsby. Luhrmann and his wife, Catherin Martin, keep to a sort of family business: she is the production designer of his films. The 1963 version was directed by Peter Brook. Filmography. Brook was known primarily for stage work at the time he undertook production of Lord of the Flies. From 1950 to 1970 he was affiliated with the Royal Shakespeare Company. Brook still has a website devoted to his life's work. To date he has produced 13 foms and television programs, but the latest of these was in 2002. Brook still produces theatracal plays, mounting at least one major production a year. The 1990 version was directed by Harry Hook. Filmography. Hook has five theatrical feature films to his credit since 1987. The bulk of his output is television films and documentaries. The Lord of the Flies was his fourth major motion picture project. Born in 1960, he is considerably younger than his predecessor as translator of Golding's novel to the screen. To me, sound is a large part of a film experience. And the music is often the best part of the sound (and the most memorable). Russell Garcia’s score is pretty much run-of-the-mill for late 1950s horror or drama. His filler music uses triads to mark time, often indulging in heavy brass figures that really overpower the visuals. The intention, I suppose, is to let you know how to feel, perhaps to let you know how the character is feeling. But brass doesn’t really do much for me, musically, unless it is part of a mixture of timbres. Garcia introduced a pleasant theme which recurs throughout the film in various disguises. But he fell prey to the cliché “big music” of the time and stomps on our emotions with it, as if we couldn’t possibly know what to feel in a given moment. He also adeptly uses finely divided notes to create a sense of mystery in many scenes of the film. Klaus Badelt wrote the 2002 score. His music is stand-alone composition. If you get the CD and listen to the naked score bereft of visuals and dialogue, it is even more effective as music in its own right. Garcia’s score could not stand that way. Badelt's themes and motifs support and drive Wells’s visuals forward. Badelt’s score, perhaps as much a slave to the style of the moment as Garcia’s, at least came about in a era where the music is expected to undergird the emotion, not to cue you how to feel. In other words, where Garcia used music to create a sense of bewilderment and urgency in the audience, Badelt composed music to reflect how he felt when he first saw the scenes. At least that’s how it seems to me. I own the CD of the soundtrack and listen to it several times a year. It is a tiny role. But it is a critical, pivotal one, and unless the miniscule part of Balthasar is played well, the play loses some of its irony and drama. Balthasar is always present, following Romeo around like a puppy in Zeffirelli’s version. But he has very few lines, and none until nearly the end of the play. Yet Keith Skinner makes the most of the part in the 1968 film. Balthasar is one of the Montagues in the initial shots of the film, walking through the market with Abraham. But he has no lines. In fact, the script does not mention the character by name but once in Act I and again with his spoken lines in Act V. But he is one of the “servants” referred to whenever the Montagues are abroad. Skinner is engaged with whatever is going on, whether he is in the background, or standing next to his master. 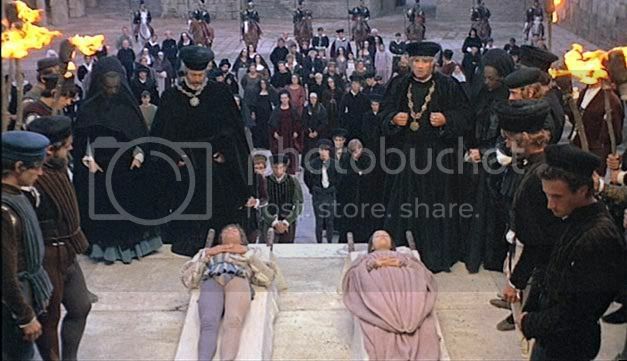 This allows his pivotal role in the misunderstanding of Act V to come forth naturally in Zeffirelli’s film. Skinner was about 18 when the movie was being filmed. But he looks more like he’s 15 years old. In Baz Luhrmann’s version of the play, Balthasar is played by Jesse Bradford, who was roughly 16 when the film was being shot. His character is a bit more aggressive, although reduced in scope. He is not a servant, but a close friend of Romeo’s. Why, then, is he so poor while Romeo is a filthy rich Montague kid? No explanation is offered. In your mind would the play be the same without Balthasar? There is one theme that the book, and both movies share—the idea that Golding had about the basic nature of the human being. Lord of the Flies is brutal and some will find its assertions offensive: that even a group of children left to their own devices, no matter how hard they might struggle to retain the vestiges of civilization would fall into beastly behavior (“beastly” here meaning that they would behave more as beasts than as people). If you read the book carefully, and watch the films with equal care you will detect (as I think I did) that there is a second theme: that not everyone will fall into this “degenerate” style of relating to his fellows. Some will indeed find a secure and deeply-fastened ability to consider others’ welfare even under the grimmest of circumstances. But Golding, Brook and Hook insist that the depraved side of human nature would prevail, regardless. One symbol of the falling away of civilization is in the costuming. Some of Brook’s younger feral boys forsake clothing altogether, while most don breech clouts and paint their faces and bodies. By 1990, Hook was up against a rating system that would have slapped an NC-17 on his film if he had opted for no-clothing costuming, so he keeps his boys wearing something the whole way through. Garments that begin as briefs turn into tan-color, tattered attire that resembles loin-cloths more than underwear. The face and body paint is just as much in evidence in both versions, but is more arresting in the 1990 remake because it is in color. The blood does not appear black, but red when painted onto the cheeks of the youngsters in Hook’s film. Frankly, I think Hook’s costuming option is more realistic. There is something inside the civilized human that will probably cling to certain vestiges of civilization, even while relinquishing others. In other words, I think the decline to beastly behavior would have certain limits, although they might be different from child to child. It seems more reasonable to me that the boys would continue to wear their underwear, even in a tropical environment, retaining a slim standard of modesty. It is the way we raise our children today. In 1963 there were still a lot of farm boys in the audience who had skinny-dipped in the swimming holes of creeks and rivers across America and England. By 1990, there weren’t so many. In the book, the majority of the boys abandon clothing altogether. Only three of the characters in the 1963 film are seen abandoning their clothing to that extent (Samneric and one other little-‘un). Even these don’t go naked all the time. But the clothing in both films becomes tattered and revealing, as if revealing the beastly kernel of human nature that Golding apparently believed in. Now I get to learn whether it was what you expected. There a scene were Jack sets on his first hunting. The group finds a little pig, Jack takes his knife and tries to kill the animal, he has it under the blade, but does nothing. That could have been a great moment of conflict, the moment when the struggle between theri civilized and wild side is shown, but the scene only lasted like 10 seconds, making it just another scene. If I had to describe the film in one word, it would be: OK. There a scene were Jack sets on his first hunting. The group finds a little pig, Jack takes his knife and tries to kill the animal, he has it under the blade, but does nothing. That could have been a great moment of conflict, the moment when the struggle between their civilized and wild side is shown, but the scene only lasted like 10 seconds, making it just another scene. I think your observations are valid. Sometimes trying to stick too close to a source novel cripples a film. On the other hand, Brook's almost docudrama style of shooting allows moments of brilliance. Brook's framing gives way to some really nice shots. I'll go back to your review and read it again now that I've seen the film. ...just astonishing, really. Loving everything. Remember that most of the work so far has been to rework the three old threads, but I have watched three films again for a new Rematch (Maltese Falcon). My mind is buzzing with ideas. I have reviews to write, and essays, and graphics to create. It will be fun. And it is fun to go back and rework the essays I wrote before. I'm expanding at least a little bit what I had for the tech information posts. Thank you for acknowledging this, Hank. My soul really appreciates it. A little word like this is very much like what I once supplied to kiddo at RT...without even knowing it. And it is enough to keep me going with a smile on my face. Whether I wrote this or not in the original thread...I can't remember. But the first time I saw Brook's version of the film I was totally unimpressed. Years later I did some reading about it, and learned how much work it took him and his crew to create a film that comes across like a student film in parts. Also, the docu-drama style, look & feel of the film was not unusual for the early 1960s. After my research I revered the work he put into the project enough to spend over 30 dollars to buy the Criterion DVD release. After my research I revered the work he put into the project enough to spend over 320 dollars to buy the Criterion DVD release. Wait...320 dollars for a Criterion? That is a huge typo. Thanks for catching it. No...thank Goodness, only 32 dollars. I should proof-read every time, not merely most of the time. I'll go fix that. Thank you. Now that the thread has been running for a bit over a month, does the linking and the structure I devised work for you? You can get around fairly easily by clicking on graphic links to posts. There is standardization in the layout of posts and of the various Rematches. It really helps me find the essay broker posts and others that I need to go to and update frequently. I hope it helps y'all navigate the various simultaneous presentations of comparisons. Does anyone have any suggestion(s) that I could incorporate at this point to make things easier? Keep in mind that I won't undertake anything that requires me to fiddle with all of the posts! ^ hehe, pretty much. I, too, am impressed with the sheer amount of effort you are putting in to this (even if I am admittedly only reading the segments that interest me based on the films they concern). My thanks go out to you three! Some day, I'll watch the original Planet of the Apes copy I have with me. I hope it's soon. These essays comparing the films will become available. If you get a link indicator, click on a thumbnail image to go to the essay post. The character Casper Gutman, Esq. in the book is a fat man with jiggling bulbs of flesh. In both films entitled The Maltese Falcon he is a raconteur who eschews any handling of a gun personally. Casper Gutman in the 1931 film, Kasper Gutman in the 1941 remake. For the 1936 version, the character was altered to become a villainous woman, Madame Barabbas, who is no less underhanded than the Dashiell Hammett character who begat her. In the Rematch of these three films I will compare the characters among the three films, but also with the novel version of that character. I think it will be fun. I hope you enjoy reading the comparisons. At least one writer sees the 1960 version as anti-violence in theme, and believes this was the theme of H.G. Wells’s novel. But I don’t see how the two thematic ideas are so easily un-entwined in the book or either film. Technology throughout human history has enabled more and more efficient and devastating violence toward “enemy” people. It is done in the name of “deterrence,” yet escalation of destruction has never worked as a deterrent. That is probably because it is the desire to hurt others that pushed this technological spike along. Perhaps Wells was cautioning people against believing that Progress marches only one direction and never falters. Furthermore, those who criticize or praise films for being in line with the themes of the source material forget that the urge to create underlies even business ventures such as films. It is not the director’s job to evaporate into the ether, become a slave and merely copy what someone before him or her wrote. Their time and creativity are being poured into the film project. As I see it they have a right to add their own creativity to the mix. Film is collaborative, and that begins with the writer’s ideas being co-opted and adapted for the visual medium. I would find it a flaw in a film if it did not add thematically to what an original book said, or what an earlier film expressed. Otherwise, what’s the point of making the film? The Morlocks oppress the Eloi via technology in both films. In both versions they are the machine masters. In the novel they are the machine masters. Since machines are the epitome of technology, it is just as valid to say that Wells wrote an anti-technology, or anti-Progress novel as it is to say that he wrote an anti-violence message. ‘I grieved to think how brief the dream of the human intellect had been. It had committed suicide. It had set itself steadfastly towards comfort and ease, a balanced society with security and permanency as its watchword, it had attained its hopes--to come to this at last. Once, life and property must have reached almost absolute safety. The rich had been assured of his wealth and comfort, the toiler assured of his life and work. No doubt in that perfect world there had been no unemployed problem, no social question left unsolved. And a great quiet had followed. ‘It is a law of nature we overlook, that intellectual versatility is the compensation for change, danger, and trouble. An animal perfectly in harmony with its environment is a perfect mechanism. Nature never appeals to intelligence until habit and instinct are useless. There is no intelligence where there is no change and no need of change. Only those animals partake of intelligence that have to meet a huge variety of needs and dangers. I offer this in support of the idea that Wells’s original theme was just as much one of anti-technology as it was anti-violence. Can Rules Make Fighting More ‘Civilized’? Life was very formal in Verona in the period when Romeo and Juliet is set. There were challenges that must be put forth before anyone assumed a quarrel was intended. The Act I encounter between the Montague servants and the Capulet servants in the streets of Verona begins with questions about whether a challenge is being issued. Of course, in Zeffirelli’s film a Capulet trips a Montague, and that leads to a “civil brawl.” The Prince comes and issues his ultimatum to stop the fracas. And you may have noticed that he doesn’t actually kill either Signori Montague or Capulet when the upset with Tybalt and Mercutio is brought to his attention. The ’96 version of the film has a rumble that begins at a gas station. The culmination of a slapstick-style scene is that there is a huge fire! Is this symbolic? Or is everything over the top in Luhrmann’s play? You’ll have to admit, Baz doesn’t show much restraint in his presentation of the story. You can feel the stylistic influence of Peckinpah and Scorsese during the years that intervened between the two cinematic R&J’s. If you’ve seen both films, how does this idea of rules applied to altercations strike you? Do rules make fights any less barbaric? The music for Franco Zeffirelli’s 1968 film was scored and conducted by Nino Rota. Rota was already well-known for scoring most of Fellini’s films, and four years later would reach wider acclaim for his score to accompany F.F. Coppola’s The Godfather. Glen Weston sang the hit song “What is Youth?” from the movie. Henry Mancini had a hit recording of it but re-titled the melody, “A Time for Us.” The melody is beautiful, and moving, and lasting in its effect. 1996 film. 10th Anniversary CD of the music from Amazon. Digital download available. shikydraks has posted 15 tracks as videos at YouTube. The music for George Pal’s film was scored by Russell Garcia. The 1960 original soundtrack CD is available at Amazon and DeepDiscount. Klaus Badelt did the excellent score for the 2002 version. A hunt for links to purchase CDs of the soundtracks for these films was largely unsuccessful in 2008 when the thread went up on RottenTomatoes Forums. My attempt to update the links for this corrierino version has been equally fruitless. The music for Peter Brook’s film was scored and conducted by Raymond Leppard. The music ranges from atonal mischief to angelic choral pieces sung by a children’s choir. No soundtrack recording is available (other than EBay and like sites). A fellow who put together an extensive website about the film has a page about the soundtrack that includes two links to mp3 recordings. Here’s the one to the original film theme, “Kyrie Elaison” performed by the boys of the choir (QuickTime plug-in required). The theme is available from YouTube. Lord of the flies 1963 - First meeting. The “Kyrie Elaison” song is heard in this scene as the choir march down the beach to heed Ralph's summons with the conch. Lord Of The Flies 1963 Part 1 of 9 parts. Apparently the entire film has been uploaded by EnglishAssist. Once again, who knows how long it will remain on the site? I suppose you could consider that you're listening to the soundtrack if you watch the film! Philippe Sarde did the scoring duties for the 1990 remake. No studio released soundtrack recording is currently available. That is a shame, because a lot of the music he composed for the film is quite listenable as stand-alone music, unencumbered by the visuals. Here is a listing of the contents of the original CD release. Used copies are available through Amazon, and most likely E-bay, of course. Resources posted on YouTube are always subject to disappear, but for now there are a few YouTube sources for the music from the 1990 Lord of the Flies. There is one theme that makes excellent use of near quotations from Stravinsky along with a boy choir singing without words (Track 9: Bacchanalia). The boys' voices are both ethereal and creepy simultaneously. You'll have to hear it to know what I mean. This plays beneath the hunting/conflagration sequence at the end of the film. You can link directly to the clip on YouTube. While I'm in here to check out something else...bump! These essays comparing the films are available. Click on an image to go to the essay post (you will get a pointer when you hover over the image). Pal’s Eloi are innocent, naïve and vulnerable. They are child-like, and pampered with no ambition (which annoys George to no end), but they still have the capacity to rise to the occasion near the end of the story. They understand very little of the world around them. Thus, when George presses a lad to explain what has just happened at the entrance gate to the Sphinx, all the boy can say is, “It is ‘all clear,’” and when pressed further, he resorts to slowly and carefully repeating, “All. Clear.” You know, if you say it really slowly they will understand! The Simon Wells version makes the Eloi shrewder and much more worldly-wise. Pal’s Eloi don’t understand why the night is dangerous, since they are basically children. The peaceful, fearful Eloi in Wells’s film know what the Morlocks are and exactly why they are to be feared. Kalen even fights against them, although in large part the Eloi flee when the Morlocks climb up out of the ground. Mara (Weena’s replacement) has a younger brother whom she cares for and protects. This gives the 2002 Eloi more of a sense of connection and more of a sense of being human. The 2002 Eloi are builders and planters, and do not depend on the Morlocks for anything, but they are their prey. I don’t think this is what great-grandpa Wells had in mind when he wrote of the Eloi, but it is the writer’s and director’s prerogative to change whatever they wish when making a derivative work. The Director of Photography for George Pal’s version was Paul C. Vogel. Biographical information on Vogel is fairly rare on the net, but I have learned that he was a Lieutenant in the U.S. Army Photographic Corps, during which time he directed his only documentary short, "Army Champions." Much of his career was spent as the DP on short films, including some in the continuing theatrical series The Little Rascals (known theatrically as "Our Gang"). He lensed the remake of The Philadelphia Story, entitled High Society, in 1956. I have never seen that film, but I did see his work in the 1959 Tarzan flick, Tarzan, the Ape Man starring Denny Miller. The film was a disappointment to me as a 7 or 8 year old. Vogel ended his career as DP on a number of TV series episodes. Apparently, in those olden days working on a certain echelon of film more or less locked you in there. 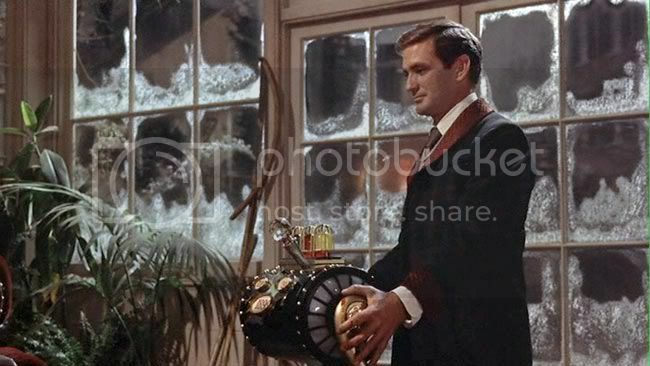 The Time Machine was not a "prestige" title when it came out in 1960. It was science-fiction, thus meant for kids instead of adults, not able to support the fee of a really well-known and powerful director of photography. Still, Vogel did exemplary work on this film, creating the look of the past, present and future, and committing his photographic vision to what has become a classic film. The 2002 version was photographed under the direction of Donald M. McAlpine. He was the DP on another film in this thread, the Baz Luhrmann production of Romeo+Juliet. If you study his Filmography, you will see a lot of other famous titles in the list. He has been the director of photography on 55 titles from 1969 to 2010! You can read an interesting article, The Future Ain’t What it Used to Be about McAlpine's work on this film (from the cameraguild.com website). McAlpine has worked on a large number of high-profile titles, including Moulin Rounge!, Peter Pan (2003), The Chronicles of Narnia: The Lion, the Witch and the Wardrobe, X-Men Origins: Wolverine, and more recently Main Street. His career has had him in charge of lighting and principle photography on a lot of titles that you've likely heard of. Between Paul Vogel's time and McAlpine's time the prestige of films with science-fiction content rose amazingly, to the point where someone like McAlpine can be worked into the budget of such a movie. Whatever flaws you might see in the 2002 remake of this title, they are not the fault of the DP! The Director of Photography for Peter Brook’s version was Tom Hollyman. Hollyman was a still photographer who had to teach himself motion picture photography in short order. Hollyman used his sons as subjects, took them to a park in New York City, and shot a couple rolls of film to gain an understanding of motion photography techniques. Before departing for Puerto Rico, Hollyman developed rigs that would be useful on location. Below, he is seen photographing James Aubrey as Ralph on the beaches of Vieques, Puerto Rico. According to IMDb, Hollyman has no other credits as Director of Photography. The award-winning cinematographer has worked on a number of European feature films and television productions, including the "Eurocops" series. His first British feature was Connie Templeman's Anglo-French "Nanou" in 1985, since when he has worked on Harry Hook's "Lord Of The Flies", Fraser Heston's "City Slickers II", for which he photographed the Bull Run sequence, Domenique Girard's "Omen IV", Harry Hook's "The Last Of His Tribe" (for which Fuhrer won the 1992 Cable Ace Award for Best Cinematography) and "Tom & Viv", his previous collaboration with director Brian Gilbert and producers Marc and Peter Samuelson. Most recently he was director of photography for John Schlesinger on "Sweeney Todd". The The Tale of Sweeny Todd film mentioned is not the Tim Burton musical version. The Director of Photography for Franco Zeffirelli’s version was Pasqualino De Santis. Although he has 54 titles to his credit as lighting cameraman or Director of Photography, apparently none of them have reached the level of recognition that Romeo & Juliet achieved. Between 1965 and his death in 1996, De Santis worked in feature films and television, as well as documentaries. He was the cinematographer for "Fellini: a Director's Notebook," which was broadcast in the US in 1969 on NBC television. The 1996 version was photographed under the direction of Donald McAlpine. You may recognize the name as the cinematographer for Simon Wells on the 2002 The Time Machine film. McAlpine has worked with Lurhmann on Moulin Rouge as well as this Romeo + Juliet adaptation. McAlpine's resume includes 55 titles which he photogrpahed between 1969 and 2010. Among his credits are Mrs. Doubtfire, Peter Pan (2003), Breaker Morant, and others that are of broad renown. I haven't seen the Luhrmann version of the play. However, it seems to me like challenges and jest are a civil way to cool off and deflate a physical altercation. Much like Cyrano using self-deprecating humor to disarm his opponents. In fact, it seemed there was more than one occasion where Tybalt was ready to laugh the confrontation off and leave. Mercutio was bound and determined to go hooks, however. 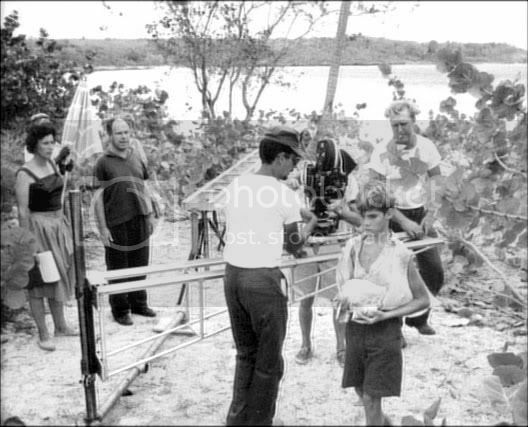 I like that shot of the filming of Lord of the Flies. Actually, I like all those "Behind the camera" pics, it reminds me of the whole world that's alive behind the camera. Quite fascinating. Since this is the closest I will likely get to a request in this thread, I've cropped and adjusted four of the stills I captured in 2008 when I was creating the original Rematch Threads. Director of Photography Tom Hollyman with a short-load 35mm camera and a traditional tripod, during the shoot. NOTE: Now that I look at this man, it doesn't appear to be Hollyman. Perhaps one of his assistants. There are also shots of Peter Brook manning a camera when it was convenient to shoot with more than one camera for a take. 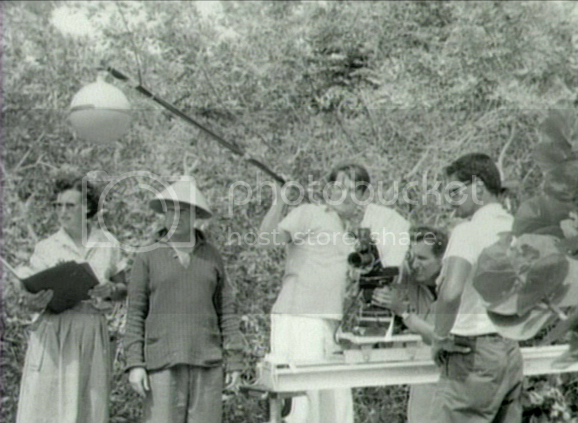 From left: The script assistant with the script book open to make notes as they shoot; director Peter Brook with a clever hat; the sound recordist or his assistant with a mic on a boom (the sound recorded was for reference; all the dialogue was re-recorded at the dormitory after each day's shoot due to the sound of crashing waves that rendered it unusable as recorded live). The white globe around the mic is to cut wind noise by diffusing the air; Tom Hollyman sighting through the 35mm camera viewfinder; another crew member, but I've no idea who. Note that the camera is on a special rig developed by Hollyman for this shoot. 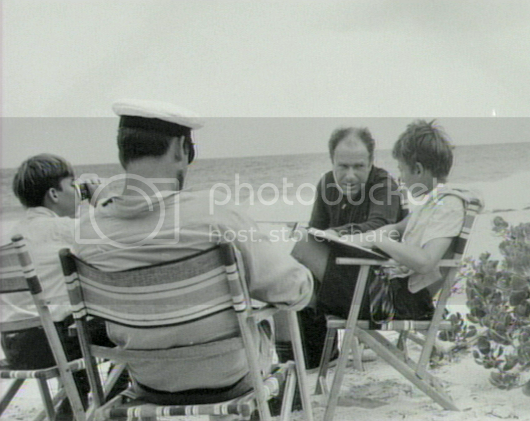 Peter Brook with the boys who play Jack and Ralph (Ralph is drinking something, on the left) and someone wearing a sailor hat. They are discussing how to play a scene; judging from the boys' costumes, one of the earlier scenes in the film. Tom Hollyman hand-holds the camera to shoot the close-up of Piggy just before his fateful moment at the end of the film. Note the production assistant holding the actor so that he can lean farther backward and also look upward, without fear of tumbling backward. He is supposed to be shouting up a cliff to Jack at the top. There may be captions with these images on the DVD...I don't recall. At any rate, if there are captions on the DVD, these aren't them! Cool stuff is cool. Thanks Gort!